AMES, Iowa - Hog farmers are collaborating with Iowa State University to provide more habitat for monarch butterflies through on-farm research projects. Since 2015, farmer members of the Iowa Pork Producers Association have worked with researchers from Iowa State and the Iowa Monarch Conservation Consortium to plant and survey monarch habitat plots on their land. One of the many challenges monarch butterflies face is the loss of milkweed and nectar plant habitat throughout the upper Midwest. When the project was proposed three years ago, it seemed like a unique approach, according to Ben Crawford, Iowa pork producer and environmental services director for Prestage Farms of Iowa. The habitat plantings include milkweed and a diverse array of blooming species to provide nectar for adult monarchs throughout their life cycle and seasonal migrations. Female monarchs lay eggs exclusively on milkweed plants. National and state efforts focus on establishment of new milkweed habitat to reach conservation goals. The Iowa Monarch Conservation Strategy seeks to establish 480,000 to 830,000 acres of monarch habitat by 2038. Findings from the research collaboration are helping refine practical recommendations for establishing monarch habitat across Iowa’s landscape. Voluntary efforts to establish monarch habitat are intended to complement existing environmental stewardship and conservation programs for farmers, while still adhering to best practices for livestock production. 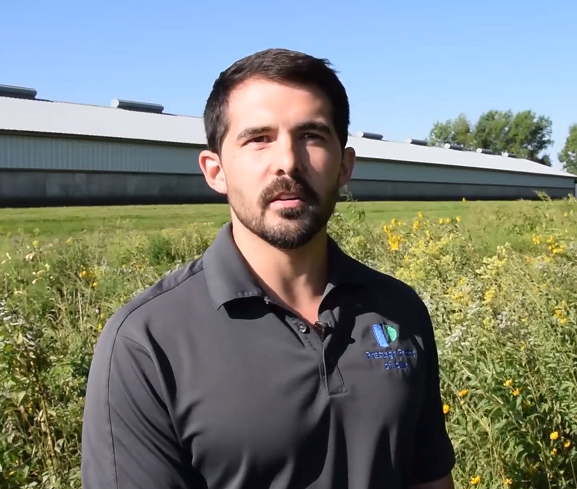 Ben Crawford, environmental services director for Prestage Farms of Iowa, is featured in a new video (linked below) about Iowa pork producers’ cooperation with researchers to plant and survey monarch habitat plots on their land.